On Thursday April 3rd Colby College held a “Day on Censorship” to celebrate the annual 2013-2014 Center for the Arts and Humanities theme called Censorship Uncovered. A variety of events filled the campus throughout the day; from a fun “censored” photo booth in Pulver to a fascinating display of unpublished materials in the Robinson Room in Miller Library. In the afternoon, the school held an event in the Pugh Center called “Burn it or Bind It,” as students added humor to the discourse and argued to censor certain books by burning them. At night, students and faculty viewed the film, The Square, in the Colby Art Museum and attended two events in Pulver, the Debate on Censorship and the Censorship Around the World Panel. While I was busy in classes and unable to stop by all of the events during the day, I fortunately attended both the debate and the panel later in the evening. At these two events, students and faculty joined to unpack the current discourse on censorship and discuss how censorship affects our everyday lives. The events throughout the day successfully celebrated the yearlong theme by bringing the discussion straight to the Colby community. The first event I attended was the Censorship Debate from 7-8 at night. While the debate was originally scheduled to occur in LoPo, the space was unfortunately double-booked, so instead, students and faculty gathered on the couches opposite the Spa in Pulver. Despite the location change and the small group in attendance, the debate was intriguing, fun, and surfaced the main issues that surround censorship. Colby students lead the debate, with two students battling on the either side of the censors hip argument, pro-censorship versus anti-censorship. As the debate commenced, the student on the pro-censorship side argued that censorship is a necessary evil for the government to ensure security and privacy for all citizens in the country. On the other side, the student argued that censorship is an unnecessary evil, as the government uses censorship to both hide information and take away the citizens rights. Although the event did not draw a large crowd, the debate was entertaining, informative, and revealed the complicated nature of the censorship debate. Following the debate, the group joined together for a relaxed conversation concerning the issues that the students raised. I thought this successfully stimulated conversation and allowed for the audience to discuss their own opinions on censorship, is it a necessary or unnecessary evil. During the conversation, I noted that many comments kept coming back to this question: who has the power to decide what is censored? Since this idea was at the forefront of the censorship debate, the group contested in what circumstances it is necessary for the government to censor information. A fellow classmate then raised the question in what ways that censorship exists at Colby, arguing that Colby does in fact censor information from students. I immediately realized that I had never actually thought about censorship that exists on our campus. Personally, I think this is an important issue to discuss because I see that there is a strong divide between the students and the administration. Especially with the recent controversy over the renovations of the Colby libraries, the administration holds a certain power over the entire Colby community. Students often times are prevented from holding events or speaking out since the administration aims to portray a certain image and standard to outsiders. This conversation allowed me to think about the ongoing debate of censorship in the context of Colby and gave students and faculty an interesting way to participate in this discourse. After a short break for refreshments following the debate and discussion, more students and faculty arrived at 8:30 PM for the Censorship Around the World Panel in LoPo. Six panelists – five students and one faculty member – had the opportunity to discuss their personal experiences with censorship in different countries. Before the panel started, I was intrigued to learn about fellow classmates views on censorship and how it has affected their lives. Over the course of an hour, the panelists discussed censorship in six different countries, Sudan, China, Singapore, Rwanda, Czech Republic and Malawi. While each panelist told very different stories about their experiences with censorship, several common themes emerged from each of their talks. 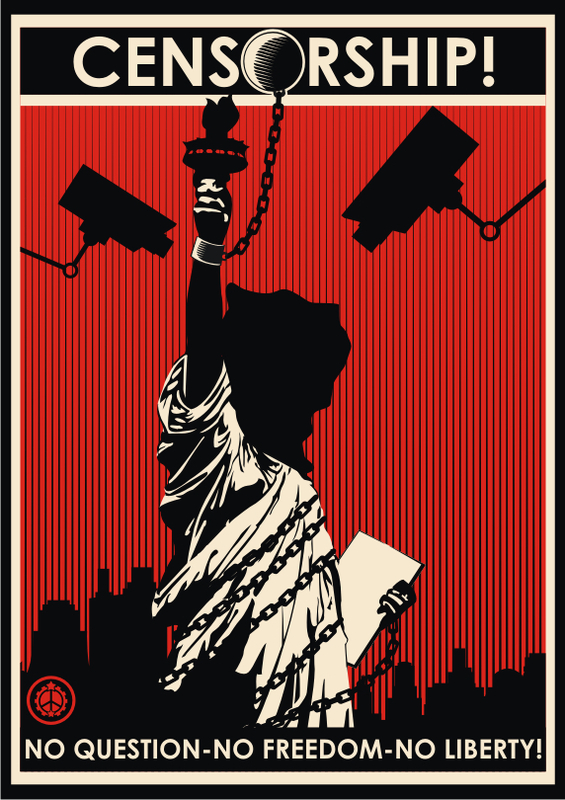 The most significant commonality was the role that the government plays in censoring information. One student from China revealed that in the past the Chinese government would censor all forms of media such as newspapers and television. As a result, her family was uninformed of important social and political issues that took place in the country. Another panelist who studied abroad in Rwanda discussed how censorship is imbedded in the 1994 Rwandan genocide as a result of the government. However, several of the panelists also noted that the development of modern technologies provide the citizens with greater access to information. In Singapore, citizens today are less afraid to speak out because they are more connected through the Internet. Similarly, people in China today have more freedom through social media sites such as Facebook and, as a result, many people using these sites are more aware of social and political issues. However, the panelists argue that the countries still continue to censor information from the public. As a result of government censorship in the Czech Republic, many citizens are unaware of certain radical political groups. The student from Malawi also mentioned that many people throughout the country continue to endure censorship, a result of extremely limited Internet access – a mere 10% of the population. The commonalities among the panelists reveal the global prevalence of censorship in our society today. Most importantly, the events throughout the day uncovered ways that modern technologies work to disrupt the current debate on censorship. As the Internet provides wider accessibility to information, people around the world have new freedoms to combat censorship. Furthermore, the events allowed for both students and faculty to learn and discuss the current censorship debate. Several of the panel members even remarked that participating in the event broadened their perspectives on censorship, even though it has been a large part of their lives. For me, I was able to start thinking about censorship that exists on Colby’s campus, a topic that is rarely discussed. Despite the day’s success, Colby’s “Day on Censorship” lacked student attendance in many events and neglected to thoroughly address the presence of censorship that exists in the United States. Why didn’t the Censorship Around the World Panel include a student panelist discussing censorship in the United States? This absence reveals an interesting si de of the censorship debate, one where we as Americans fail to look critically at our own country. Moving forward, students and faculty should establish an annual “Day on Censorship” in order to facilitate a campus-wide discussion concerning these issues, especially ones close to home. Despite my few criticisms of the day, overall I believe that the “Day on Censorship” effectively engaged both students and faculty in fun, thought-provoking events. The day further revealed the importance of discussing censorship that exists in our society, since there is no simple answer to the current debate. All content is © 2019 by Censorship Events Blog. All rights reserved.